I’ve been pretty quiet lately. Life has been busy, and every spare moment I’ve had has been spend working on the line-for-scene cards for the Miracles revision. The line-for-scene technique is covered in Holly Lisle’s Create A Plot Clinic, it’s also covered briefly on Holly’s writing diary. 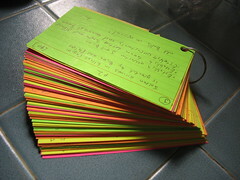 I finished up this morning with 109 cards (16 green, 36 yellow, 31 orange, and 26 red). I intend to start the read-through/write-in Friday. I still have a few post-its to stick onto the appropriate cards, and a few notes on some background things that need some shaping up. My goal was to have the type-in finished by July. I’m still hoping, but I’m not sure how exactly I would pull that off. This entry was posted on Wednesday, May 23rd, 2007 at 10:51 pm	and is filed under Miracles. You can follow any responses to this entry through the RSS 2.0 feed. Both comments and pings are currently closed. Thanks. I didn’t get to start Friday as planned (entire family came down with a cold and it kept knocking me out), but I’m going to start right now (before everyone wakes up). We had that cold, or one like it. Wiped us out for about a month before everyone finally stopped being sick at each other. Really excited to hear how your revision goes.